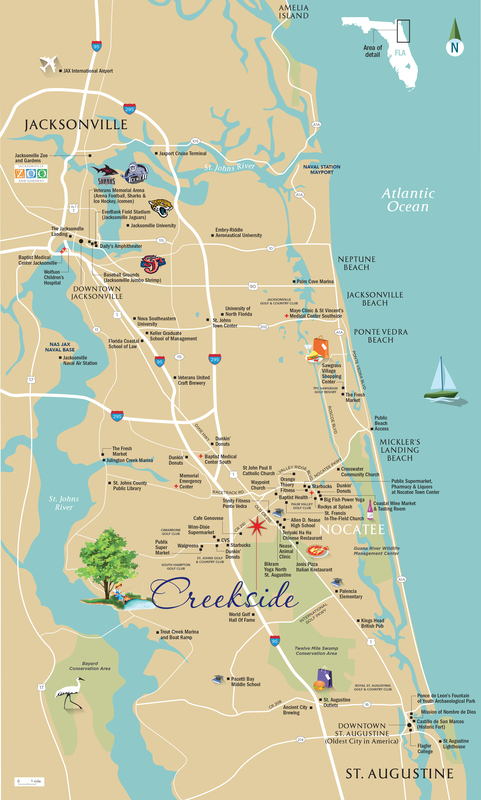 Located in the Nocatee area, Creekside offers easy access to a phenomenal location near I-95 and CR 210 Creekside represents the best of what St. Johns County has to offer. Creekside is surrounded by A-rated schools, great healthcare and shopping as well as cultural and entertainment opportunities nearby. Designed with nature in mind, using special animal culverts to minimize impact to wildlife, our natural greenspace, lakes and ponds are woven into the fabric of Creekside life and blended with all the conveniences of outstanding amenities nearby. It’s a natural choice and best value for today’s active families. Creekside is located within Florida’s #1 rated school district, St.John’s County, with A-ranked public schools as well as excellent private schools nearby. Children living at Creekside will be off to a bright start as they grow, explore and learn through our neighborhood schools where they’ll see many of their neighbors and friends. Parents will be pleased with the excellent teaching staff and positive learning environment so children can maximize their intellectual, creative and social skills. They’ll live and learn right in the neighborhood! Jacksonville boasts an extraordinary amount of green space – more than 111,000 acres of preserved land space and holds the title of the largest urban parks system in the U.S. and you’ll find miles of beaches and waterways nearby. Its convenient location, reasonable cost of living, high quality of life and business-friendly government make Jacksonville one of the top ranking cities in a variety of business categories. Nevertheless, the city is dedicated to preserve its quality of life by carefully balancing commercial and residential development with transit and infrastructure capacity and preservation of green space. Unique entertainment and cultural options include the city’s professional symphony, a variety of museums, ballet and opera companies, dozens of theatres, dance companies, vocal ensembles and orchestras producing events year-round. It’s a dynamic city with major employment hubs, an international airport, a vibrant culinary scene, shopping, sports events and a host of other things to do. A pleasant drive along Florida’s historic coast brings you to America’s oldest city, St. Augustine. There’s plenty to see and do in this charming city and its nearby ocean beaches. From surfing to shopping to fishing off the pier, the list of fun things to explore is virtually endless. St. Augustine makes a great day trip or wonderful staycation. Sights to put on your list include the historic Castillo De San Marcos National Monument fortress, the Lightner Museum, and the historic downtown district. Don’t miss some of these scenic unspoiled beaches: Ponte Vedra Beach, Vilano Beach, Anastasia State Park, Butler Beach, and Crescent Beach. World-class golf and recreational destinations makes this a top vacation destination.